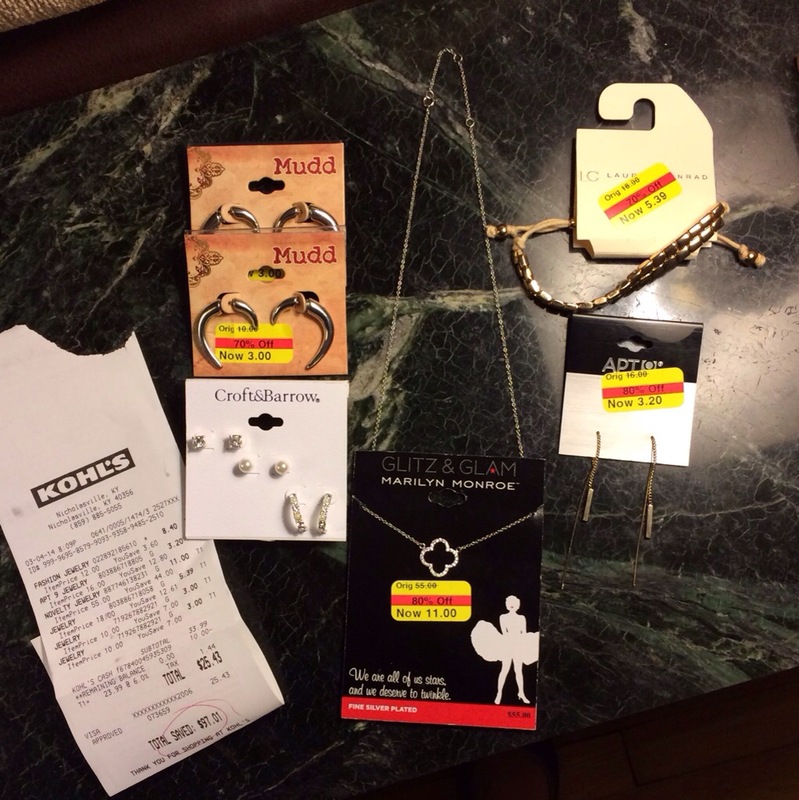 So I had $10 in Kohl’s cash and felt like shopping this evening. Tried on clothes and wasn’t liking anything. Went over to jewelry though and I found more than a few things I liked! – two pairs of Mudd brand silver horn earrings for $3 each. I bought both pairs of these because the backs aren’t tight and I kinda suspect I may lose one at some point. $6 still isn’t bad. – three pairs of Croft & Barrow faux diamond and pearl earrings $12 and 30% off made them $8.40. I bought these because I wanted to try them with the horn backs actually … And didn’t want to risk earrings I like to potentially being lost. – one pair Apt.9 gold dainty chain earrings. These look great but the chain is startlingly uncomfortable in your ear so this may be my first AND last chain earring purchase. – and one dainty quatrefoil necklace from a brand I’ve never heard of. Tacky packaging, cute necklace. Not worth the original $55 since it’s silver plated and rhinestone but definitely worth $11.